So, on the theory that many folks would be traveling &/or tired last night, I tested out Heritage's weekly Sunday night auction for the first time since they moved to the live-auction format. Before, everything ended at once at 11:00 pm Eastern Sundays, but their interface couldn't handle the influx of last-90-second traffic, so I found sniping impossible. I have bid with literally 70 seconds left and not have those bids register in time. So this format is presumably much better. So now it starts at 7:00 pm Eastern, but begins with Original Art. Which takes more than an hour and a half. I was looking at stuff ranging from an original art cover or two, to early Sgt. Rock appearances to early CGC Superman (# 15, 18) to high-grade Bronze. Biggest problem is you actually have to sit there for 4-5 hours for the auction to complete. I think it took roughly 45 minutes per 100 lots, & there were 800. I was going to bed by the time they hit the Gs. Ended up snagging a CGC 9.4 All Star Western 10 (1st Jonah Hex) for $750 (including their 20% premium), which is an _all-time_ (since 2003) GPA low. Current GPA is $900, & at its peak in 2010 the book was selling for $1,600. But, it's opportunity cost. The book was a consolation prize since I was the under-bidder on this, a cool Bart Sears Justice League Europe cover that I remember being featured in his Wizard Magazine in "How to Draw" column. 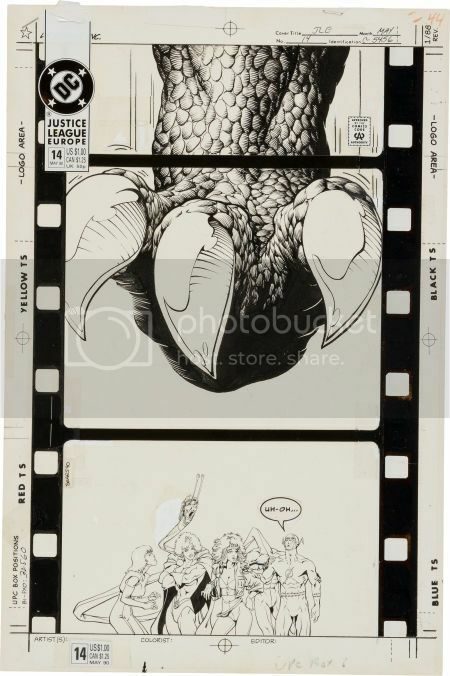 I was the underbidder here at $750 (same price as the Jonah Hex) but it sold for $775. Which would you have bought? All Star Western 10 no questions asked. But then again, I'm a key collector and not an art collector. All Star Western 10, but like Whet, I'm not a comic art collector. I was looking at stuff ranging from an original art cover.